Burgess CEP (Previously Burgess Architectural Products) have developed an extensive range of suspended ceiling systems. They continually invest in new manufacturing techniques,equipment and tooling in order to supply their products in a responsive and efficient manner from a quality controlled environment. The Burgess Company name has been synonymous with quality engineered metal ceilings for over 50 years. In the 1950s Burgess patented and introduced the clip-in metal ceiling tile that has endured to the present time and remains an attractive and economical solution to satisfy the most demanding specification criteria. Burgess CEP was formed in June 2014 and includes the acquisition of Burgess Architectural Products and integration of CEP Ceilings Ltd. By bringing together these two well established ceiling tile manufacturers, customers can look forward to an increased product offering, a refreshed market approach and a great partner for all their ceiling requirements. Two brands which have a combined 100 years experience in designing, manufacturing and supplying suspended ceiling and acoustic solutions, come together to bring you the ultimate choice of materials, finishes, colours and solutions. Whether you need a bespoke metal tartan grid ceiling, a high performance acoustic solution for a classroom, easy-clean vinyl ceiling tile for a food preparation or restaurant area, an attractive, fresh white tile for an office environment, or a moisture and micro-organism resistant tile for a hospital… Whatever you’re sector, or design you have in mind, Burgess CEP have the solution to suit. At Tennants we are thrilled to be Irelands sole and independent distributer of Burgess CEP Biocote products for active Bacterial Control. Biocote® is a world-wide patent protected powder coating technology that has excellent advanced anti bacterial qualities. The active agent is based on natural products that are proven to be safe. The active agent incorporated into Biocote®is Silver, which is integrated into the product at the time of manufacture creating a concentration of silver ions on the surface. When bacteria come into contact with a Biocote protected surface, the silver binds with the bacteria and causes their enzymes to break down. 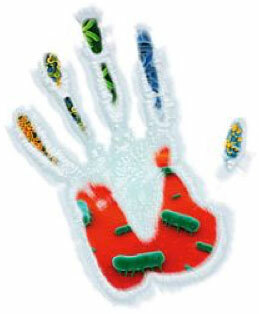 The enzymes cannot therefore produce energy stopping the bacteria from multiplying and causing them to die. Biocote®silver antimicrobial technology is one of the key pieces in the jigsaw of effectively reducing levels of bacteria in hygiene conscious environments. The silver technology complements cleaning methods to give an additional line of defence against Bacteria, mould and funghi, including MRSA, Ecoli and Salmonella. Biocote® does not function in the same way as antibiotics and there is very little evidence to suggest bacteria have become resistant to Biocote as they can to some antibiotics.